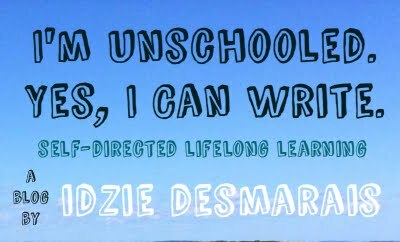 A collection of all my unschooling writing, both from this site, from other places, translated work of mine, and interviews! Unschooling Creates "Gaps in Education"
Do Unschoolers Have Gaps in Their Education? I Do Have a Problem with Authority. I'm Just Not Convinced That's a Bad Thing. Why is Unschooling so Fringe? The Ignorant Commenters Strike Again: "But You Have to Learn to Get Along With People You Don't Like!" How Do We Value Ourselves? So You Want to Leave College. Now What? Curfews: Is There a Better Way? Why People Don't Get Unschooling #1: Don't Trust Yourself! Unschooling Isn't New. Really, It Isn't. Why I Think Unschooling is the Best Option... For Everyone. Unschooling: A "Hands Off" Approach/Unschooling: o abordare de tipul “nu te băga”?